I found this fun jewel matching game for you! 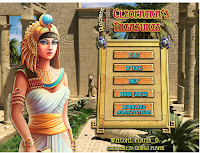 In it, you have to match Cleopatra's jewels. To play, you'll need to have Flash installed on your device. Let the game load before clicking play. It might take a moment or two. Have fun!